How Long After Dinner Do You Serve Dessert? If you’re throwing a dinner party or just having guests over for dinner, it’s customary to serve dessert. How long you wait to serve dessert is an important decision to make. There’s no right or wrong answer. Rather, there are some things you should consider before making your choice, as well as some options to choose from. Dinner parties and special events often have big, filling meals, so guests need time to digest their food before tackling a heavy dessert. That’s why waiting 15 to 30 minutes before serving dessert is a good choice. It gives guests a break from eating and lets people relax. Serving your guests dessert too quickly can make them feel rushed, like you’re trying to get them finished and out of there, but waiting too long can make guests impatient and restless. If it’s a small group, such as family members, consider asking them if they’re ready for dessert. This lets the guests have more say when dessert is served. You might get a collective response, such as “In a little bit” or you might get a variety of answers. If it’s not too much trouble, serve dessert at different times to accommodate your guests, such as serving the guests right away who are ready for dessert and waiting for the others who need a little time. Some parties and events have desserts that can be self-served, such as pre-sliced pieces of cake, brownies and cookies. These desserts are taken at a guest’s convenience. 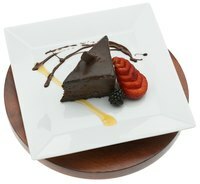 This gives guests more say when they eat dessert and lowers the pressure for the guests to eat at a certain time or a certain amount. Self-served desserts are typically offered at less formal events, such as a cookout. After dinner is over, consider where your guests are. If they’re still sitting at the dining room table, they’ll likely be more eager to get dessert and finish eating than if they’ve moved to the living room after dinner, and are relaxing and watching TV. It’s also important to consider where you want to serve dessert. Your guests won’t like moving into the living room to relax and then 10 minutes later having to return to the dining room table, so consider where you’d like to serve dessert, such as at the dining room table, in the living room or on the back patio. If the guests are in a more relaxed place, such as the living room, you can wait longer to serve dessert, such as half an hour. However, if they’re still situated at the dining room table, it’s best to serve dessert quicker after the meal is completed. Chowhound: How Long Should Dinner Guests Have to Wait for Dessert and Coffee After They Finish Their Meal?